Platforms unveiled for Divison Transit Project connecting East Portland and Gresham by 2022. Newly-debuted TriMet transit plans for Gresham and East Portland are packed with promises — including higher capacity, faster speeds and what authorities hope will be increased ridership. But the 30 elevated platforms sited for Southeast Division Street east of 82nd Avenue will also establish a new relationship between cyclists and transit users: The bus stop is the bike lane. "It is a new tool that we're considering for the region," said Jesse Stemmler, station lead for the Division Transit Project. "We're looking really at the details at this point, and really looking at view sheds." Indeed, sightlines will be critical for cyclists transitioning from buffered bike lanes on Division to the 18-feet-wide elevated platforms. The platforms have a marked lane that allows bikers to travel up, across and over, while passengers are instructed by signage to "WAIT BEHIND LINE." When buses are docked at the station, officials say they expect pedalers, e-scooter users and others to halt while people scurry on and off the bus. Media got a sneak peek at the new designs while touring a life-sized plywood mockup temporarily constructed at the 181st Avenue Park & Ride in Rockwood on Thursday, Oct. 18. TriMet employees play-acted as riders and bikers to put the new platform through its paces. Officials borrowed a C-TRAN bus from Clark County while they prep to purchase 32 similar 60-foot-long articulated vehicles for about $1 million each. 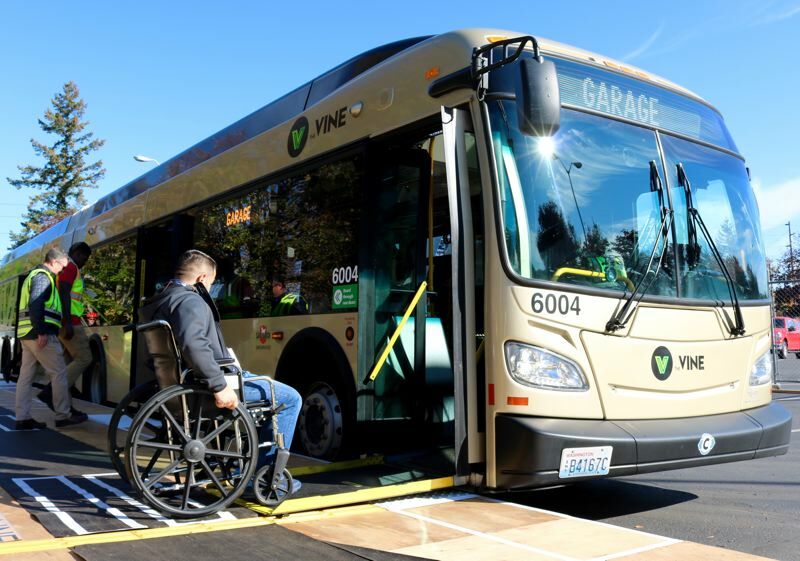 With an estimated total cost of $175 million, the 15-mile route between Southwest Portland and the end-of-the-line Cleveland Avenue MAX stop in Gresham is scheduled to be up and running no sooner than 2022. TriMet is counting on the federal government to fund 50 percent of the project, but that still hasn't happened yet. "It's going to do so many great things," said Dylan Rivera, spokesman for the Portland Bureau of Transportation. "Our plan for accommodating growth is to increase transit service." Rivera said the city has already invested $3 million along Division Street, with another $7 million in the pipeline. 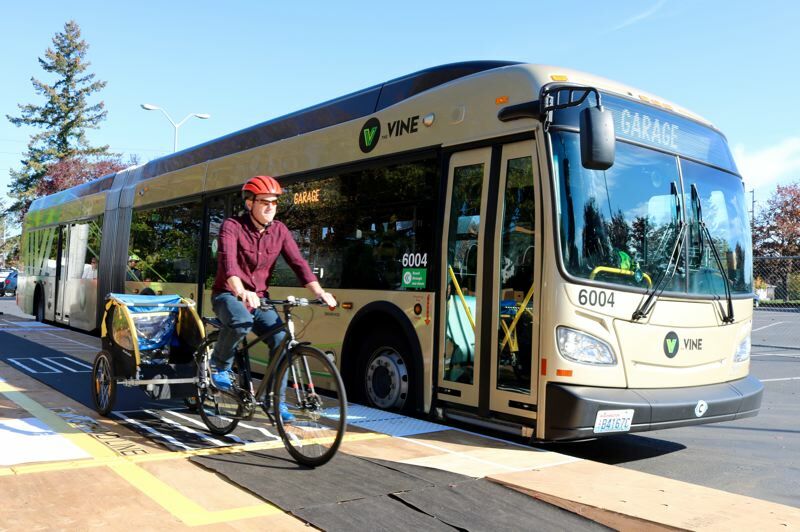 Standard Trimet buses are 40 feet long, and officials say tacking on the extra 20 feet will allow for 60 percent more riders as well as space to stow bikes inside, rather than on a rack at the bow of the bus. The longer buses have three lighted entryways, which means fares will not be checked by the driver at the door. A wheelchair ramp is attached to the front entrance. TriMet says giving the buses priority at traffic signals and faster boarding should boost route times by up to 20 percent. Buses will run every 15 minutes during peak periods. For Jeff Moreland, president of lead contractor Raimore Construction, it's a $60 million job that has allowed his certified Disadvantaged Business Enterprise (DBE) to hire 40 people, with another 60 to 100 hires planned. "We've been able to employ a lot of people from the community," said Moreland, who played a transit rider during the mock-up. "The ultimate goal of this (DBE) program is to graduate out." 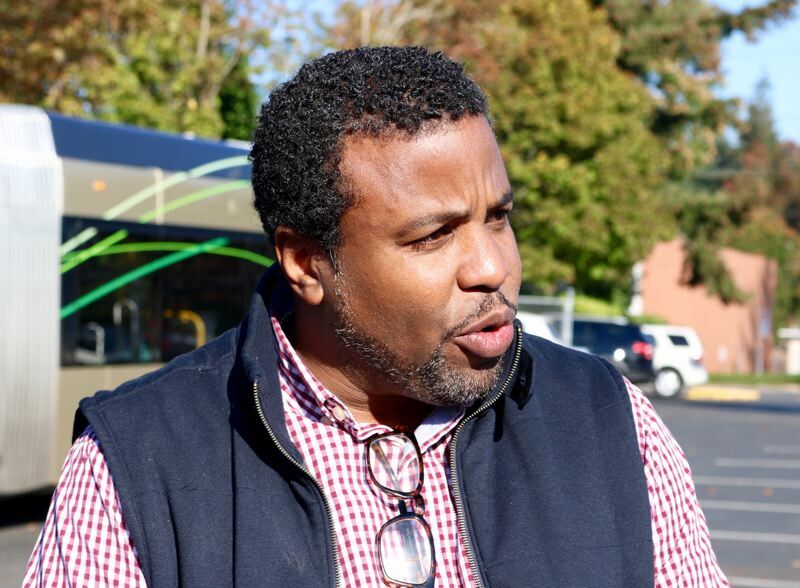 "These transit projects are huge in terms of creating economic capacity around the nation, and it's no different here in Oregon," added James Posey, a co-founder of the National Association of Minority Contractors and a one-time candidate for mayor in the Rose City. Moreland said the new transit platforms are based off designs used in Toronto. Previously-released renderings for the Division Transit Project showed bus stop islands separated from bike lanes, but TriMet ultimately nixed that idea because the size of the government's right-of-way is too small and leaders wanted to avoid displacing residents or businesses. Plans to extend the transit line to Mount Hood Community College were canceled due to cost concerns as well.